This is strange stuff, chunky and surreal. One can see Magnus Johnstone's style shifting radically over time. In the '70s and '80s, the forms swirled and looped, resembling Dr. Seuss on acid. But by the '90s, his shapes began to grow more angular, and in the Aughts, downright fractal. The stylistic reference points are as much sci-fi and aboriginal as they are art historical. The content is wide-ranging, but all fantastical. 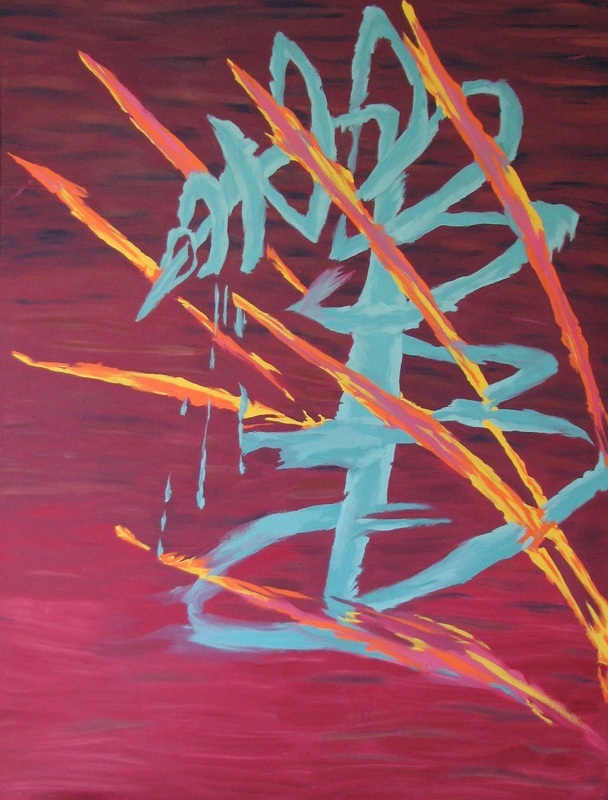 Sometimes it's abstract, but the title gives a hint at the inspiration, as in WormWood (1979). Other times, pieces appear abstract at first because it takes a moment for the subject to emerge. Figure-ground distinction is tricky in Johnstone's work, but if you remember the phenomenon of "Magic Eye" images from the '90s, it helps. Wait a moment, for example with Swimming With Dolphins (2010), and you'll see what's going on. Johnstone (1952-2013) was a much-beloved Boston DJ, so the show also pays homage to him by playing his eclectic radio shows in the background.